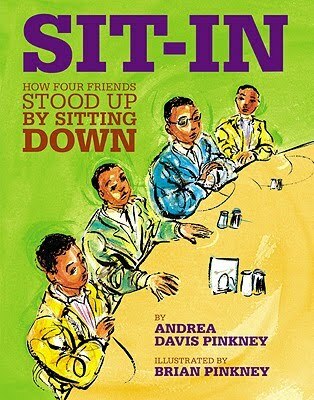 Sit-In: How Four Friends Stood Up by Sitting Down by Andrea Davis Pinkney, illustrated by Brian Pinkney. (Grades 2-5.) Little Brown, 2010. Copy purchased from a lovely indie in Georgia: Little Shop of Stories. This title has been nominated for the Cybils Award in Nonfiction Picture Books. This review reflects my opinion, not necessarily the opinion of the nominating panel. It was February 1, 1960 and the sign said WHITES ONLY, but four friends were tired of WHITES ONLY. Four friends decided to take a stand. They took a stand by sitting down at the Woolworth's lunch counter. David, Joseph, Franklin, and Ezell sat at the counter and asked to be served. And when they weren't served, they sat. Peacefully. Following the word of Dr. Martin Luther King who urged people to rise up in peaceful protest to fight for civil rights. With lyrical prose and bright illustrations, husband-and-wife team Andrea and Brian Pinkney present the story of the Greensboro, NC sit-ins and all the sit-ins that happened across the nation until segregation was overturned and blacks and whites could sit at Woolworth's and eat lunch together. This is an inspiring story with an uplifting tone - even in the face of hate, the students who sat at lunch counters were peaceful. They didn't fight back when protesters hurled angry words and coffee at them. These students, both black and white, concentrated on the words of Dr. Martin Luther King which are sprinkled throughout the text. This is an important story and it's told in an accessible way, great for sharing with elementary students. Sections in the back of the book give additional information about Civil Rights and the sit-ins. A Civil Rights Timeline lays out events from 1954's Brown vs. Board of Education ruling to the passing of the Civil Rights Act of 1964. And another spread at the end of the book gives additional facts about the sit-ins, including a photograph of some of the friends who started them. The illustrations match really well with the tone of the book. The bright yellows, blues, and greens exude a hopeful feeling, just like the text of the book. All in all, it's a beautiful book that'll add much to studies of Civil Rights and history. This is an important story that we should share with kids and Sit-In provides an accessible way to do so. Read more reviews at Carol's Corner and Shelf Awareness. Sit-In is on shelves now! It's Nonfiction Monday! Head on over to Picture Book of the Day for the roundup! What goes into a Summer Reading Club? Serving Homeschoolers: Join the Listservs!